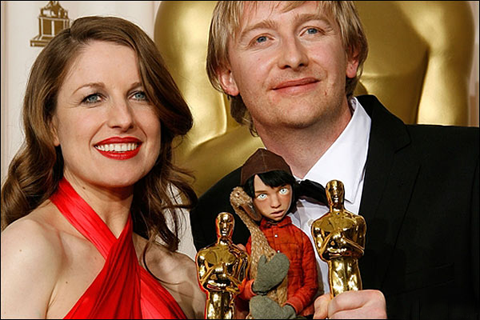 Suzie Templeton and Hugh Welchman won the Oscar for best animated short, Peter and the Wolf, as Dimples predicted they would. Congratulations! It was a great movie and we loved the goose. However, did anyone really watch anything last night except Marion Cotillard? La Vie en Rose was a badly made movie. The way the timeline was used to tell the story was very confusing and yet, no one can deny that Cotillard was absolutely brilliant. The Danish Poet Wins the Oscar for Best Animated Short! February 26, 2007 · Filed Under Animation Award Winners, Animation News, Oscar Winners · Comments Off on The Danish Poet Wins the Oscar for Best Animated Short! HA! Dimples is in shock. Dimples loves the artful 2D animation and beautiful story of the Danish Poet, but frankly, Dimples did not think there was any chance for this to win. It’s the pick of all three on the Dimples’ team. It’s stylish and it can be enjoyed on many levels by young and old. Congratulations to Torill Kove and her team on their great win. Wowzer.